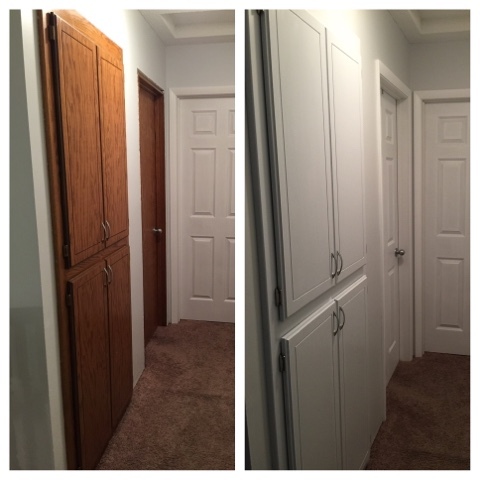 Though Split Levels come with the drawback of small closets and bedrooms, ours has a hidden gem. 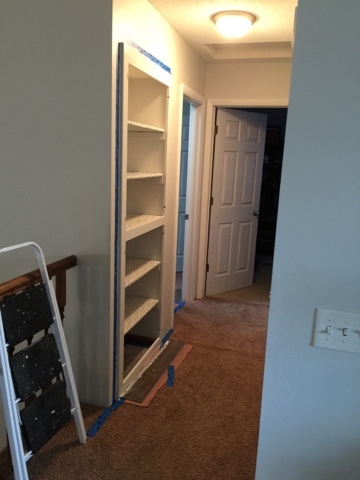 On the top level, we have a built-in with multiple shelves that can store a surprisingly large amount of necessities. 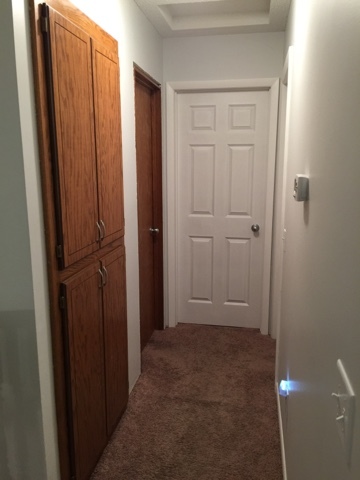 I’m not certain if this is original to the 1992 construction, but my suspicions align with that possibility since the cabinet doors are identical to the kitchen’s. Here is an in-progress shot of the hallway. The kids’ bedrooms are on this level – with Landen’s straight ahead and Madelyn’s to the right. 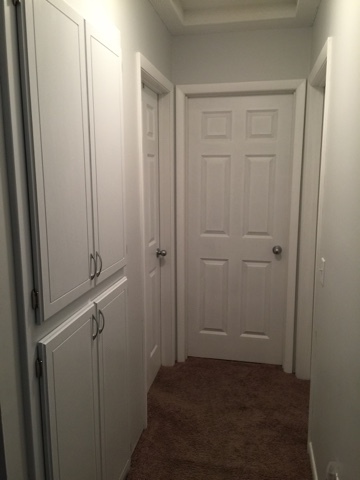 The bathroom door is to the left (taken before we started on the bathroom remodel). 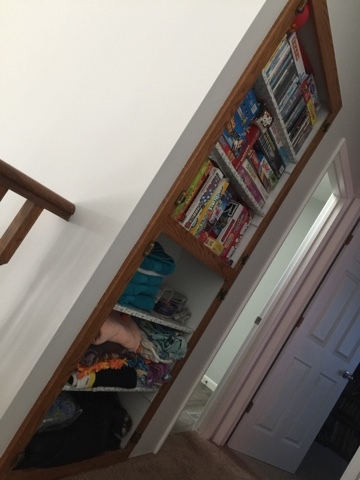 You can see how much of a space-saver the built-in is, and how well the empty space was utilized for storage. That tone of wood was originally carried throughout the house – doors, trim, cabinetry. It seemed to really date the home. It dimmed the sunlight that came in through the windows too. Going from dark to crisp white was a challenge, as it required the use of a liquid stripper to remove the sheen and prep the surface for paint. Four coats of paint later, I was still struggling to achieve even coverage. 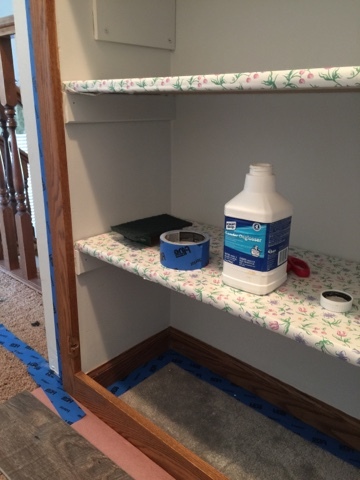 I used a Rustoleum enamel with a finish that would match our baseboards, however the tone of the hardwood was just too dark and it became quite the job. I finally achieved the coverage I was aiming for. Then, I had to apply it to the cabinet surround. Considering how long the doors took, I was not looking forward to this process. I let it dry and set for an hour, then started painting. This actually covered a lot better than the doors, and went on a lot smoother and easier. We hung the doors with the new hinges but screwed in the original handles, and I shut the door on this two-weekend project.